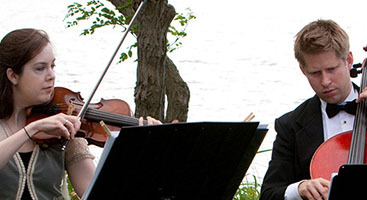 We almost didn’t book live musicians for our wedding, but we ultimately decided to splurge and book Perfect Harmony. It was one of the best wedding decisions we made, and they were probably the part of our wedding day that guests raved about the most. We booked Perfect Harmony because of their unique and vast repertoire…. 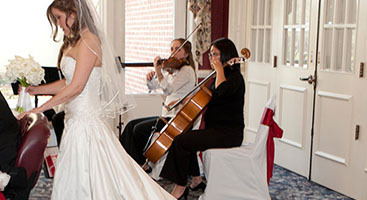 we wanted classical music before our ceremony, a mix of classical and contemporary during the ceremony, and contemporary music during our cocktail hour, and they were the only quartet we could find that could do it all. And they do it really well. They played everything from Schuman to Sinatra to Queen to Bruno Mars, and it all sounded great. We asked them to play a special piece that wasn’t in their repertoire, and they made it happen for a very reasonable fee. Gretchen was also awesome to work with…. enthusiastic, organized, and totally professional. Perfect Harmony isn’t the cheapest, but after seeing how they transformed the atmosphere at our wedding, we felt like they were an outstanding value. 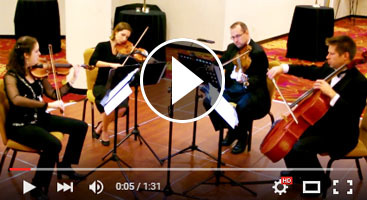 If you are looking for a quartet that can seamlessly transition from traditional classical music to classic rock to top 40 and more, you will not be disappointed if you book Perfect Harmony. 100% worth it.